DJ YODA - Who The Dickens Is He? DJ Yoda is one of Britain's most admired and original DJs, having built a reputation as the only DJ to single-handedly inject humour into UK hip-hop. Admired for his originality as well as his sense of fun, he is possibly the only DJ in the world who can fill a club cutting George Formby with Jurassic 5, or 80's pop with New York rap. Tipped by Q Magazine as one of "The 10 DJs you must see before you die", and voted alongside DJ Premier as "One of the Top Three DJs in the World" in Hip Hop Connection magazine, DJ Yoda is no ordinary scratch DJ. Born in London, Yoda represents a new brand of mix-master who will play any kind of music to make people dance - with a hip-hop set that can take the audience from underground rap to TV themes, to nursery rhymes, country, soul, reggae, drum and bass, 80's pop and back again. In the last year alone, DJ Yoda has: * Played on the same bill as Steve Martin, Dave Chappelle and Chris Rock at the HBO Comedy Festival in Las Vegas * Headlined the Lake Of Stars Festival with Basement Jaxx in Malawi, Africa * Supported Fatboy Slim on his UK tour * DJ'd to packed-out clubs everywhere from Beijing to New York * Headlined at the Star Wars film premiere in front of George Lucas himself, at the Grand Prix in Monte Carlo * Toured across America with the BullRun - the US's most exclusive car rally. In short, he gets all the good gigs. Separate to these dates, he has also recently completed a 30-date audio-visual tour, boldly stepping where no other scratch DJ has been before to cut up DVDs live in the club. This came about after his successful re-scoring of both "The Goonies" and "Ferris Buellers Day Off" on the festival circuit in 2003 and 2004. His "How To Cut and Paste" mix CD series has reached Vol. 3 - The 80s Edition - a collage of his favourite pop, hip-hop and movie moments from the 1980s. Yoda also helps to run Antidote Records, who are releasing (as well as his own mix CDs) music by artists like Steinski, Prince Paul, Cassetteboy, DJ Shortkut and Madlib. He has provided music for TV (Channel 4's "4 Music" and FilmFour trails), advertising (his scratching appears in the current worldwide Nike TV campaign) and film (Pathe's "Suzie Gold"), and has also judged three years-worth of DMC DJ World Finals. Alongside his sometime DJ partner Dan Greenpeace (of XFM's All City Show) he released "Unthugged" in 2003, and provided Pete Tong with his first ever hip-hop Essential Mix for Radio 1 - bootleg copies of which have been doing the rounds ever since. 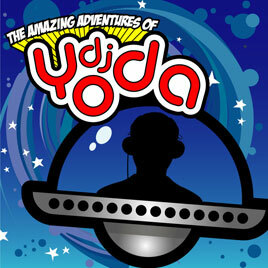 Leaving mixtapes aside for a while, Yoda has now finished up his first artist album, "The Amazing Adventures Of DJ Yoda" due on Antidote in 2006. On this, Yoda provides beats for Biz Markie, 2005 MOBO-winner Sway, Princess Superstar, Jungle Brothers, MC Paul Barman, and a host of other vocalists, and he won't stop until he works with all the cast of Sesame Street on a turntablist DJ track.